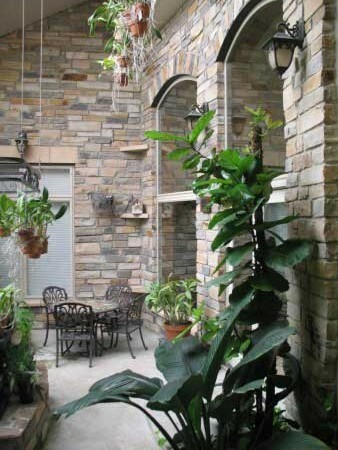 The Orchid House is a 4,400 sf residence designed for the owners’ prize orchid growing hobby and for healthy indoor air quality, minimal energy bills, minimal maintenance, fire protection, and environmental concerns. 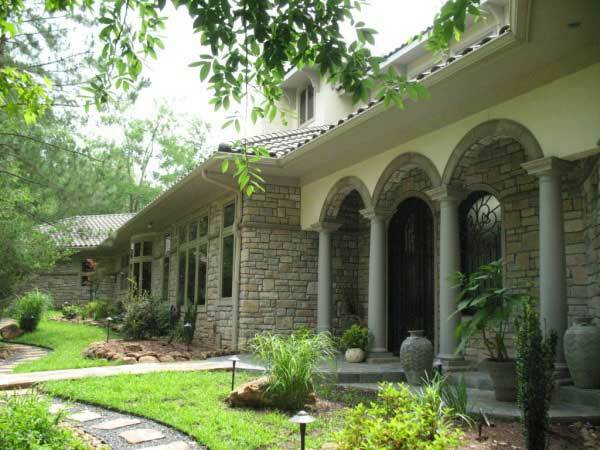 The home is designed to work with the terrain of a sloping lot and its microclimate near Magnolia Texas while integrating a voluminous 500 sf greenhouse with a 2 story ceiling, a water harvesting system, optimum roof exposure and slope for adding solar PV. EA’s’ Design for Life Barrier Envelope Concept was deployed for this home where exterior walls are made using ICF’s and the framing for the concrete tile roof is fully insulated with foam, creating an incredibly tight exterior envelope for the entire house. While the garage is attached, toxic vapors from inside the Garage are completely isolated from the house using special low-cost barriers. The central focus point for the residence’s design is the 2-1/2 story high completely passive self-cooled and self-heated orchid greenhouse/solarium. 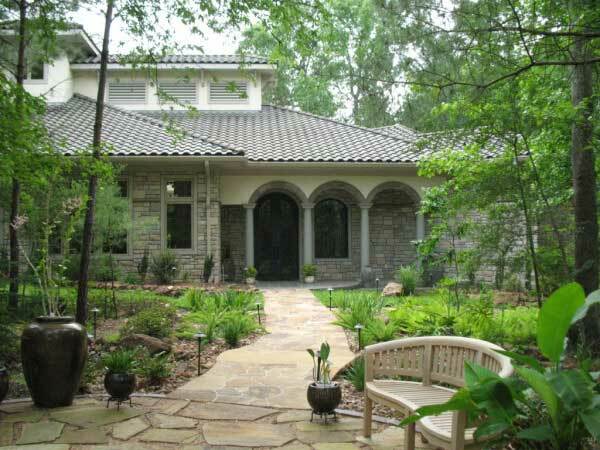 It is viewable from the main living areas, the kitchen/breakfast/family dining area and the Master bedroom. This greenhouse/solarium can be completely thermally isolated from the home any time the owner wishes, while never blocking the view. It has never required any supplemental cooling or heating for the orchids to thrive except for a misting system and fans to maintain and mimic humidity levels and air circulation like in their native forest habitat. 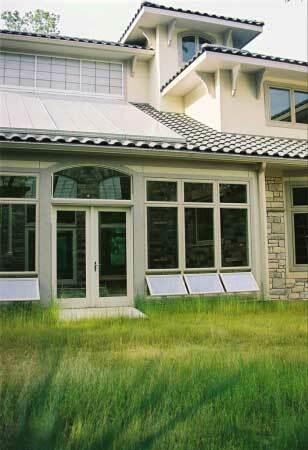 During the drying wintertime cold months, in addition to its greenhouse duties for the orchids, excess heated humid air created by the greenhouse can be vented to inside the house to improve indoor comfort to alleviate excessive skin drying conditions. 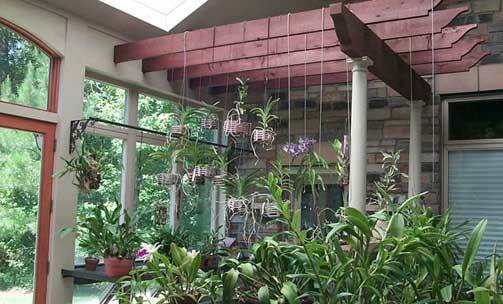 In the summertime, it simply acts as a large shade structure for cooling the house while year-round orchids grow happily inside. The greenhouse/solarium’s self-venting design never needs supplemental energy to keep it always 10o cooler than hottest outdoor summer daytime temperatures and it has never has dropped below 580 F in winter. For the main house, a separate thermal chimney system shaft/look-out playhouse for the owner’s son provides massive passive ventilation cooling when need by simply opening a couple of windows. It works so well that the door to the Master Suite clear across the house and downstairs has to be held open with a stop to keep it from slamming shut by the fan-less draft it creates. 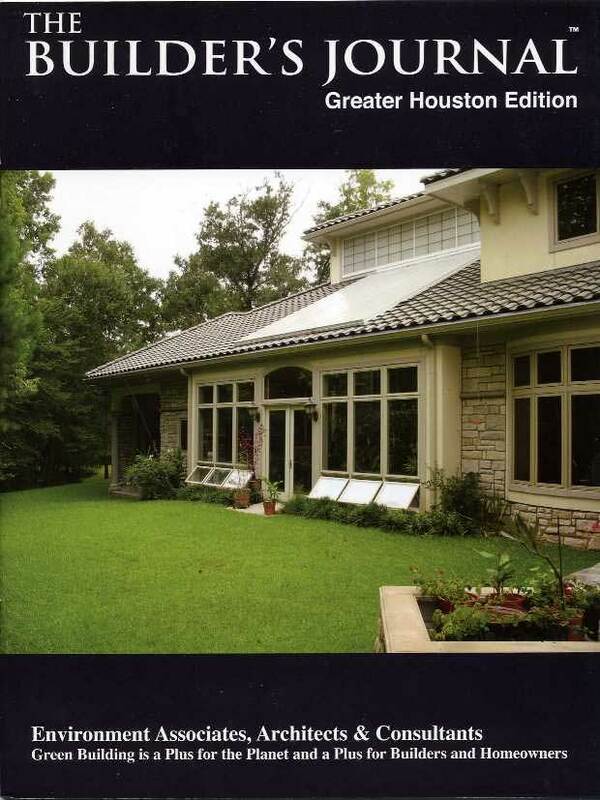 The subject of a study regarding health, comfort and energy performance by the Houston Advanced Research Center (HARC), this home has been on several National Solar Tours, carried by local TV news stations, in a program about the architect on the local PBS TV station and was published in Orchid Magazine, which has international distribution.